Parents often pack lunches that are less healthy than what the lunch lady serves in the school cafeteria. This is how nutritionists do it. Don’t be so quick to judge school lunch: In multiple studies comparing a homemade lunch to the lunch lady’s fare, school meals were deemed healthier than what mom and dad packed. Still, packing lunch is an opportunity to create healthier habits and provide nourishing foods, and meals made in your kitchen put you and your family in control. And through repeated exposure, your home-packed meal teaches your child to enjoy new foods. Beyond that, studies show that establishing healthy eating habits in these early years impacts a person’s food choices later on. That’s why nutritious lunches are key! 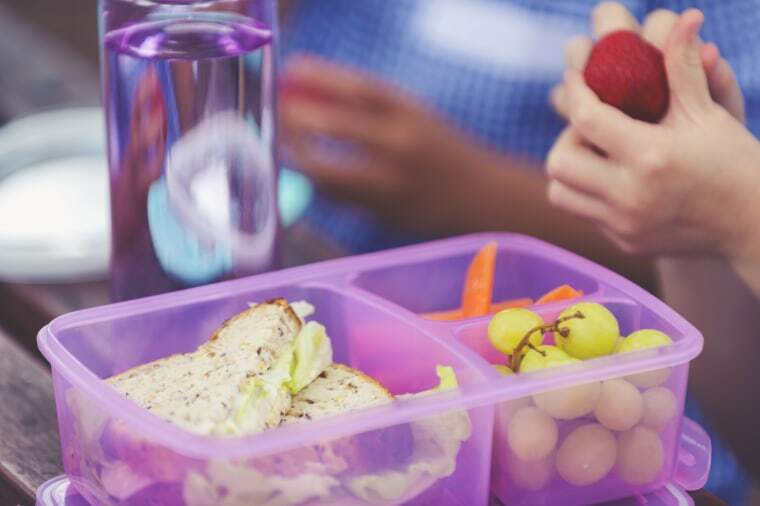 Here are some tips for packing a healthier school lunch as well as some inspiring recipes to get your school year off to the right start. If you’re not packing whole grains for your child, you’re missing an important opportunity to provide fiber, magnesium, and other notable nutrients. You’re also missing a chance to help your child expand his or her palette to include these healthy grains. Studies show that home packed meals are often lacking in whole grains, but there’s an easy fix: When packing sandwiches, crackers or pasta, insist on whole grain versions over refined, white ones. If these foods are new to your child, layer them with things he or she already loves. Say your child loves pasta with Parmesan. Swap in whole grain pasta for your ordinary noodles but keep the sauce the same. Or start with a 50/50 approach. This works for sandwiches, too, with one side being white bread and the other being whole wheat. Remember, your goal is to reach 100% whole grain foods before too long. Pro tip: Since children love to play with their food, try cutting up fruits and veggies into dipping strips and invite them to try different dips, from sunflower seed or nut butter to hummus, tahini, guacamole, yogurt, Ranch dressing, or something you whip up at home. If time and resources get the best of you, fruit canned in juice and dried fruit are easy options. There are a lot of simple ways to make eating more produce fun and inviting, as you’ll see below. Though your child might appreciate the cookie and chips you’re tucking in his or her lunch box, these snacks drive up the salt and sugar, which is one reason school meals are often considered more nutritious than home packed lunches. Over time, inclusion of these foods can lead to weight gain, which can have serious health implications as your child grows up. Instead of packing a daily treat, consider packing a snack every so often (say, once a week) or pack healthy, whole grain snacks, like air-popped popcorn more frequently. You can also use non-food party favors to add more flair to lunch boxes: Stickers, note cards with a joke or a loving message, and colorful or character-driven pencils and other school supplies are some to try. Though you may win your child over in the short-term by packing the lunch of their dreams, consistently serving up nutritious fare is the best way to ensure their good health over time. And keeping their bodies healthy benefits their wellbeing in many ways. Eating well and taking care of growing bodies can lead to improvements in school and on the field, help children grow optimally, boost body confidence, and reduce acne — all meaningful to school-aged kids. It may be hard to resist your child’s charm as he or she clamors for cookies, chips, sugary sips, and fluffy white bread, but introducing kids to better options when they’re young and impressionable can have a life-long impact. Introducing kids to better options when they’re young and impressionable can have a life-long impact. As you start packing new items in your child’s lunch box, don’t be discouraged if certain items come home uneaten. Keep it up! Remember that it could take several attempts to get your child to try something new. Make a game of it, say, by encouraging your child to try two foods of the same color (maybe a cherry tomato and a red pepper slice) or two foods that start with the same letter (avocado and asparagus), and ask which one was preferred and why. Remember that children respond to praise so pile it on as a reward for trying something new! Looking for lunch box inspiration? Here, some registered dietitians show you healthy and clever ways to feed growing bodies. You’ll notice a variety of whole grain options, from cereal to whole grain frozen waffles, which come together to create deliciously healthy meals for kids. Treats, when provided, are kept small. Meals provide produce, whether as part of the main course or on the side (or both). And while sandwiches are still featured in lunch boxes, parents today are packing other options to keep things interesting! Dietitians Cheyenne Richards, MBA, RDN, LD and Kayla Fitzgerald, RDN, LD give you multiple ways to hit several food groups—including plenty of fresh produce—in one lunch box. “The variety helps fuel daily activity and adds fiber which has many benefits,” they say. Keep in mind that these lunches may be best suited for elementary-aged children, but upping the serving size would make them appropriate for older kids. And if your child often turns up her nose at your lunch offerings, take note: “Picky eaters will love these meals as they are diverse, yet not overwhelming and there are plenty of finger foods,” they say. Holley Grainger, MS, RD, lunch box-packing mom and creator of Cleverful Living, shares this clever tip. “Have some lunch box fun and combine learning with Alphabet lunch boxes that feature nutritious and yummy foods from A to Z. Start Monday with a bento box packed with favorites that begin with letters A through E. Continue throughout the week concluding with V through Z on Friday. These simple lunches are ideal for preschool through second grade,” she says. “Every kid clamors for a “Lunchable” kit, so pack a DIY version for a fun twist on the classic pre-made lunch that uses simple and fresh ingredients,” says Grainger. Her better-for-you lunch idea uses wholesome ingredients resulting in a lunch box with fewer preservatives and less sodium. Grainger’s pro tip: Let children help customize their lunch with their favorite pizza toppings. “Anything in muffin form tends to go over well with the kids, and what I love about these is that they are protein-rich and a great way to get some veggies in,” says Jessica Levinson, MS, RDN, CDN, culinary expert and author of "52-Week Meal Planner." She also points out that they're freezer friendly, so with some planning, you can easily keep a batch in the freezer, which means they’re ready to be defrosted and popped in the lunch box in the morning. “There's a lot of research on the health benefits of fish, especially when it comes to brain development in kids, so I try to feed my kids fish at least once or twice a week. This Easy Tuna Edamame Salad is a great way to get a serving of omega-3 rich fish into kids’ diets, plus it packs in some veggies and plant-based protein from edamame, which is a favorite of many kids. Serve it in between slices of bread or with crackers for scooping,” suggests Levinson. Registered dietitian and chef, Jessica Ivey packs this chicken salad, which trades half the mayo for nonfat plain Greek yogurt. “When you substitute Greek yogurt in place of mayonnaise, you reduce the saturated fat while adding healthy nutrients, like bone-building calcium. I like to add whatever fresh fruit is in season, whether it be peaches, apples, or grapes, plus celery and red onion for more color and nutrition, and chopped nuts for crunch. Pack with whole grain crackers and more fruits and veggies,” she says. If you’re still wondering how to slip more veggies into your child’s lunch box, here’s a simple and creative idea. “These salad skewers are a fun way to add vegetables to a lunch box, especially because they can easily be dipped in a packed container of your child's favorite dressing, hummus, or guacamole,” says Lindsey Janeiro, RDN, CLT of Nutrition to Fit. Just be careful with the skewer; if there is a sharp end, be sure to cut it off with a pair of scissors prior to placing in the lunch box.